THE CANON EOS 1D MARK II DIGITAL CAMERA BODY! Canon EOS 1D Mark II digital camera with Canon EF 400mm f/5.6 L lens. The Mark II and my old favorite "toy lens" make a deadly combo for photographing birds in flight and in action. Autofocus performance with birds in flight at close range was astounding. Canon EOS 1D Mark II digital camera with Canon EF 600mm f/4 L IS lens. ISO 250. Evaluative metering +2/3 stop: 1/1600 sec. at f/4 in Av Mode. AI Servo AF with the two sensors below the center sensor activated. Yes, I am a Canon contract photographer. But do remember that you heard it hear first: by virtue of its incredible autofocus system, the Mark II will revolutionize bird, wildlife, sports (including but not limited to surfing and auto racing) photography. Careful readers will have noted over the past few years that I have been less than enamored at times with the AF accuracy of various Canon camera bodies, especially with birds flying directly at the camera. 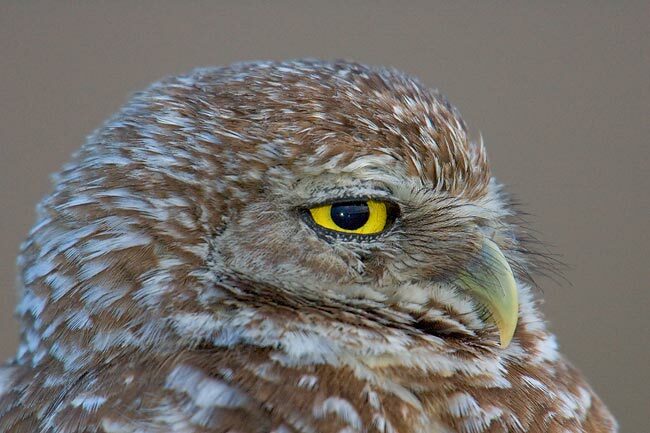 I have long dreamed of owning a camera that is capable of tracking birds in flight and producing images that are consistently sharp on the eye. With the Mark II, my dreams have been answered. Canon EOS 1D Mark II digital camera with Canon EF 600mm f/4 L IS lens and 2X II TC. ISO 250. Evaluative metering +1 stop: 1/250 sec. at f/10 in Program Mode (recommended for use with fill flash). Fill flash at -1 stop with Better Beamer. AI Servo AF with central sensor. Once AF was attained, the Mark II held focus well on the bird's white face (despite the complete lack of contrast). Then, it was just a matter of waiting for a pleasing composition to develop. 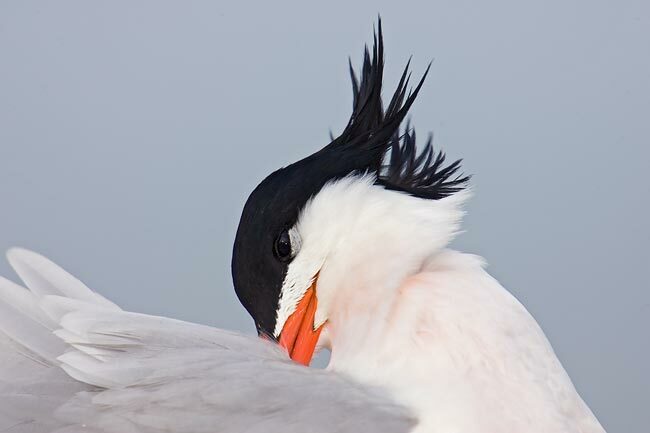 Having the bird's eye in view and the head parallel to the film plane are pretty much necessities if you are to produce a great preening image... The pinkish cast on the bird's breast is the blush of breeding plumage. 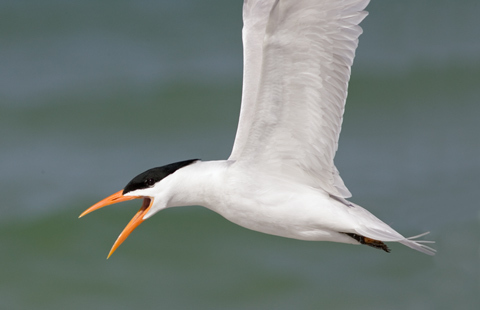 Elegant Tern is a mega-rarity in Florida as this species is breeds in Mexico and California. 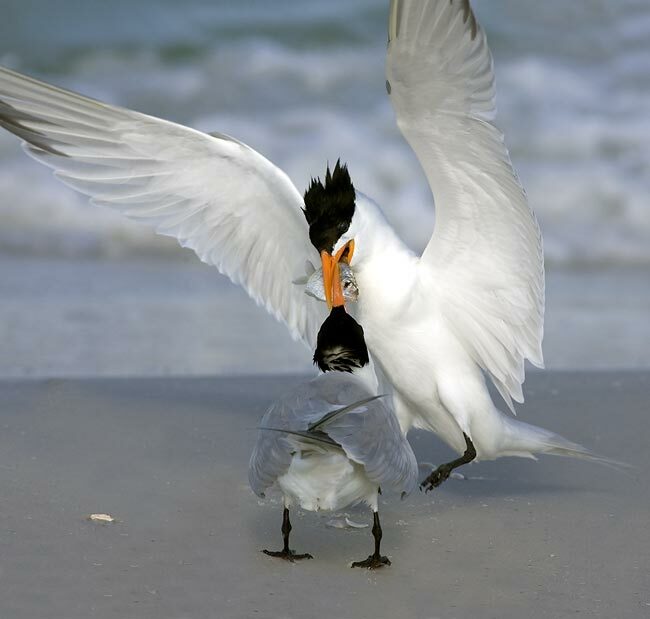 This individual has been visiting DeSoto for the past few years to mate with Sandwich Terns. As noted here previously, the Mark II has two processors, one for AF and one for AE so there is no switching back and forth... AF performance with both f/4 and f/5.6 lenses is superb, bordering on the surreal. Initial focus acquisition is virtually instantaneous when the Mark II is used with the prime lenses alone. As expected, AF accuracy with birds in flight is excellent in these cases when using the central sensor alone and excellent when using the two sensors below the central sensor (tip: the latter can work really, really well in many flight situations). I am thrilled by the fact that AF accuracy when using AFPS (automatic focusing point selection, aka "the ring of fire" or "all 45 points") is superb as well. The big draw when using AFPS is that it is much easier to stay on the bird than it is with the central sensor alone. With the previous generation cameras that featured the 45 point system, AFPS appeared to be tracking well, but most images were not critically sharp on the eye. Results with the Mark II while using AFPS (and of course, AI Servo AF) have been simply amazing. Canon EOS 1D Mark II digital camera with Canon EF 600mm f/4 L IS lens and 1.4X II TC (from the car). ISO 250. Evaluative metering +1/3 stop: 1/250 sec. at f/8. Fill flash at -2/3 stop with Better Beamer. AI Servo AF with two upper left sensors. Like most birds, the Mark II is well-sealed against moisture and dust. Though I was photographing from my Sequoia, both the Mark II and the 550 flash got good and wet. I made lots of images with the Mark II, the 500 and 600 IS lenses, and either the 1.4X II or the 2X II TCs. AF performance was very good to excellent with the 1.4X. I need to do more flight photography with this combination and AFPS. Initial focus acquisition with either of the big lenses and the 2X TC was slowed as expected; the key here is pre-focusing manually. 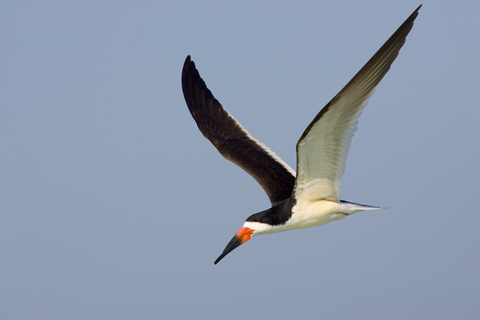 Once AF is achieved, the Mark II held focus very well on feeding shorebirds and even on pelicans in flight. You are of course limited to central sensor AF with these combinations. ISO 1600. Evaluative metering at zero: 1/80 sec. at f/8. Manual Focus with confirmation beep. Even though this image was made at ISO 1600, noise is barely visible here. In low light, low contrast situations I rely on the AF confirmation beep; set the camera's On Switch to the beep symbol and the camera will beep when you focus accurately and depress the shutter button. The LCD display on the back of the Mark II is larger and of higher resolution than on any other Canon digital camera. The histogram is pale yellow and the histogram boxes are light grey/dark grey set against a black background. Indoors the histogram is easy to read. Outdoors (where I do most of my bird photography) I needed to set the LCD brightness to high in order to see the edges of the histogram boxes. Canon really missed the boat here by not outlining entire histogram display in yellow or white or light blue; this would have made it a lot easier to see the edges of the outer histogram boxes in bright sun. The controls on the Mark II are virtually the same as on the 1D and the 1Ds, so I have not read the manual yet. As a result, I do not know how to use the enlargement feature to check for sharpness. I do not envision using this feature a lot. I have been both pleased and impressed with the image new camera's image quality but have noted that many of images of white birds (the terns and gulls) needed less red. A really sharp image from the 1Ds will be more impressive than a Mark II image when viewed at actual pixels but the Mark II's 8 megapixel files should thrill just about everyone who makes prints or publishes a magazine. The big rights-controlled stock agencies are still up in the air as to whether they will accept Mark II files for their advertising files. The higher ISO settings are remarkably noise-free, especially those that feature light backgrounds. ISO 250. Manual Mode: 1/2000 sec. at f/8. AI Servo with the two sensors below the center sensor activated. ISO 250. Evaluative metering +1/3 stop in eml: 1/400 sec. at f/10. AI Servo AF with central sensor only. 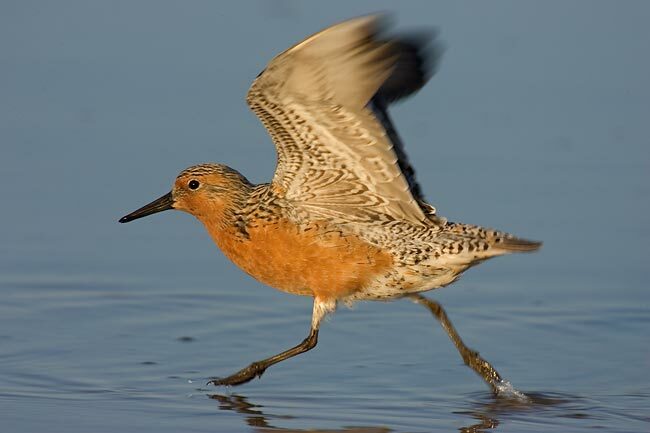 Early to mid-May offers Floridians a chance to see arctic breeding shorebirds in breeding plumage... 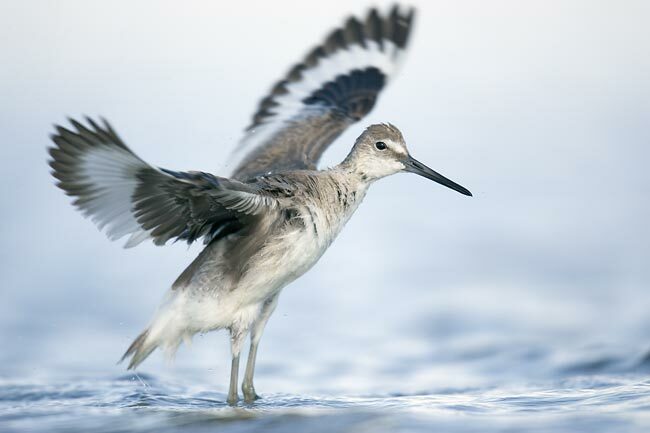 Following fast-moving birds with an effective 1560mm focal length is no mean feat. BIRDS AS ART DIGITAL PRINTS: Individually Crafted by Rick Holt from Digital Files. We highly recommend printing on the spectacular Enhanced Matte Poster Board. This paper, embedded in a matte board, offers incredibly rich colors with somewhat of a watercolor look. The prints are shipped flat and do not need to be mounted before framing. Please e-mail to discuss print style and paper before placing an order. up one stop by instinctively switching my shutter speed from 1/2000 to 1/1000 sec... AI Servo AF with AFPS. ISO 250. Manual Mode: 1/1600 sec at f/8. 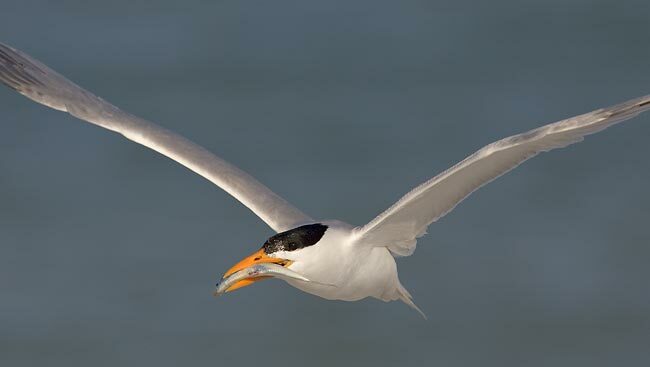 I opened up 1/3 stop from my white bird setting for the skimmers by lowering the shutter speed from 1/2000 to 1/1600 sec. AI Servo AF with AFPS. 45 point AF rocks with the Mark II!